There have been days – just the odd one or two – during my year of daily blogging (we have just moved into month eight) when I would have liked a day off; a short break and for those handful of people who are reading every day, perhaps you too! Days like yesterday remove any of those feelings. To get the sort of positive, at times overwhelming, response from people is deeply humbling and puts a spring in my step. Thank you for all your comments, likes, retweets, messages, texts and phone calls. Thank you for your kindness. Before receiving this lovely feedback, I had thought about following up my post from yesterday with a brief reflection on the importance – and difficulty – of talking about your mental health. After receiving it, I was certain that was the right thing to do. As the cliche goes, the first step to solving a problem or getting help is recognising you have a problem. This often involves telling someone how you are feeling. Getting it off your chest. Taking that first step can feel almost impossible. Tongue-tied. Nervous about what to say. Not sure any words will come out. And then. The dam breaks and the floodgates open. Talking doesn’t necessarily mean you do it in a structured, clear, rehearsed way – it just means saying “I am struggling a bit” or “I’m not feeling myself”. The language is not important in taking that first step – the step itself is the most important thing. I was lucky right from the get-go that I had Aileen alongside me. A great listener. Never, ever judging me. No “pull yourself together”. No “what have you got to be depressed or anxious about?”. No tough love. Just love. Understanding. Lots of hugs. I have lost count of the number of times – especially in the days after my admission to hospital with pneumonia (where we left much of the story in yesterday’s post) and the subsequent months and three years – that she has consoled me as I cried. That she has been there to pick up the pieces after I became overwhelmed by something or someone. That she stood alongside me so I wasn’t alone. That she still helps me every day as I continue to make my best way through life. Telling someone close to you that you are not feeling great can often feel like a massive step – you don’t want to upset them; burden them; feel you are letting them down; worry them; blame them; hurt them. You want to be there for them; you want to be their strength and support; you want to be the person they rely on; you want to avoid being seen as weak or needy. But you need to be yourself; you need to tell the truth about who you are and how you feel. You need to stop trying to be a hero. You need to talk. You need to share. You need to start the journey. Tine for another cliche – this time started by Confucius: “The man who moves a mountain begins by carrying away small stones.” Big changes can be made but only if you take that first step; if you start the journey. I started my journey three years and one day ago. I now understand what brought me to that place – why I ended up in hospital – yes, it was partly my job, my levels of stress, my inability to cope and manage the intense pressures I was under – but it was also about who I was and am as a person, what has shaped me, what matters to me. I had a breakdown because I didn’t understand these things; I hadn’t talked about how I was really feeling; I hadn’t started my journey until it was too late. It is ironic, that for someone who has always been such a good talker, it was the one thing I didn’t do. 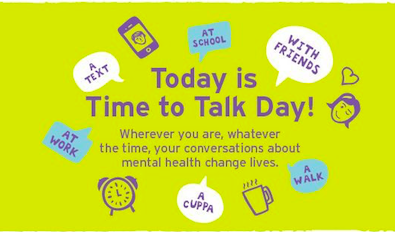 Image taken from the Mind website – this was used to promote their “time to talk” day in February. To read my son’s blogg yesterday was heartbreaking as a mum. His courage and honesty are above words and most of all the love and support Aileen our beautiful daughter in law has given Ben.